Hello TES Friends! Friday night, we made it!!! Short and sweet tonight, it's Friday night, you have better things to do. I would, but the rain has kind of put a damper on the evening. Still, had some real good thunderstorms here earlier, the kind we don't usually get here in Gotham. Made for a good show! That's right. An Iowa farm family around a bucket of corn. Now, I love corn. 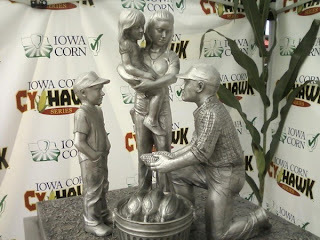 There is no corn anywhere in the world better than Iowa sweet corn. Period. I support the family farmer. I only have to go back to my maternal grandfather to find family who was raised on a farm, just outside of Roland (Grandpa didn't want to be a farmer...so he went to the State University of Iowa, where he met Grandma. So when I say I am a Hawkeye, I mean my actual existence is because of SUI/UI). All that said - this trophy, in the course of one day, is already universally regarded as the worst trophy in college football. To the artist, there is nothing wrong with the touching family scene - it just doesn't have a place in what is the modern equivalent of the Roman Gladiators. Now to the weekend ahead, we have preseason football tonight, tomorrow, and Sunday night - check the link below for coverage for your local team. Weekend is also full of MLB and LL baseball, and lots of soccer all around the globe - but not in Italy. Nope, the top two tiers of Italian soccer are on strike for the first two weeks of the season (season starts this weekend). Is it about money? Yes, but not what you think. It seems that several teams have not made all the owed payments to players that are under contract. A good reason to strike, if I ever saw one. OK friends, at noon tomorrow - two weeks! TES will be off Saturday, see you again on Sunday. I hope your have a wonderful (and safe) weekend!